Our house is a standard subdivision house with standard subdivision house problems. 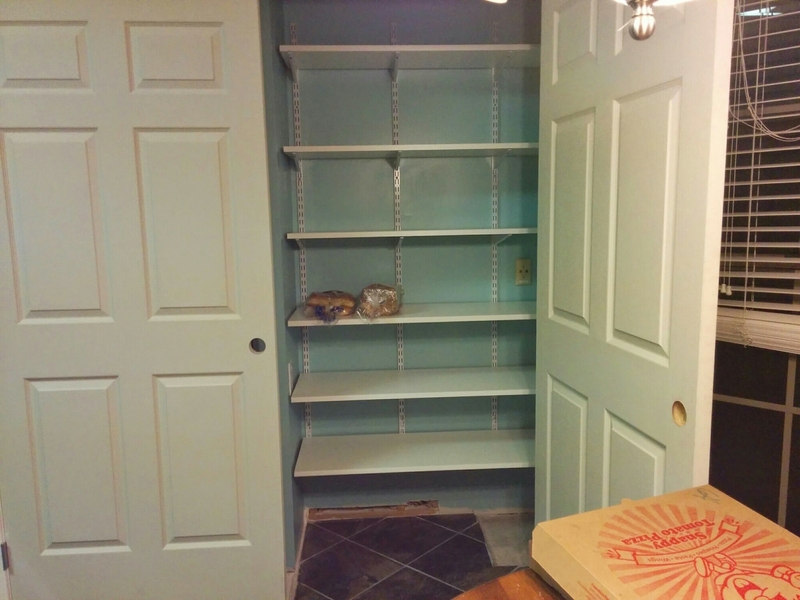 For example, the pantry was pretty small, though compared to our last standard subdivision house, which had no pantry at all, it was a big improvement. Storage in general isn’t great in the houses in our tax bracket. A few months ago, we added a bunch of shelves to our bonus room. 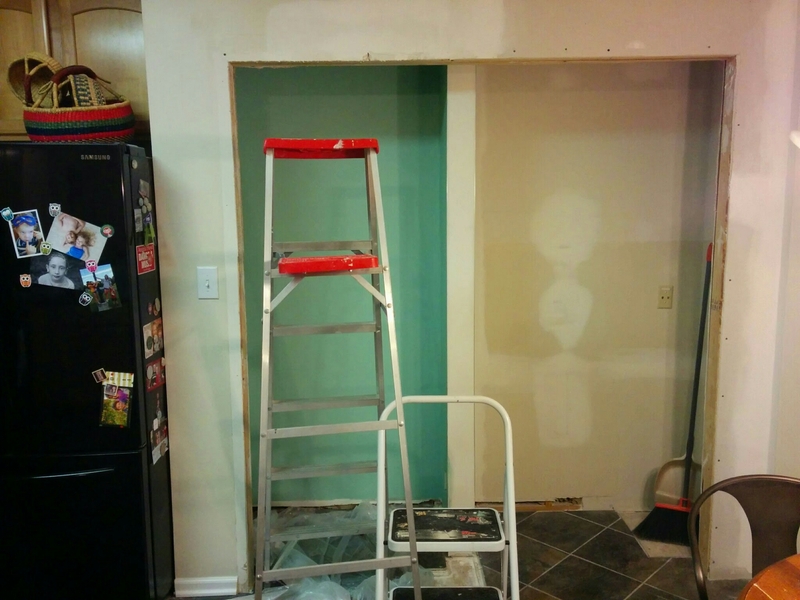 This week, we finished some remodeling of our kitchen. 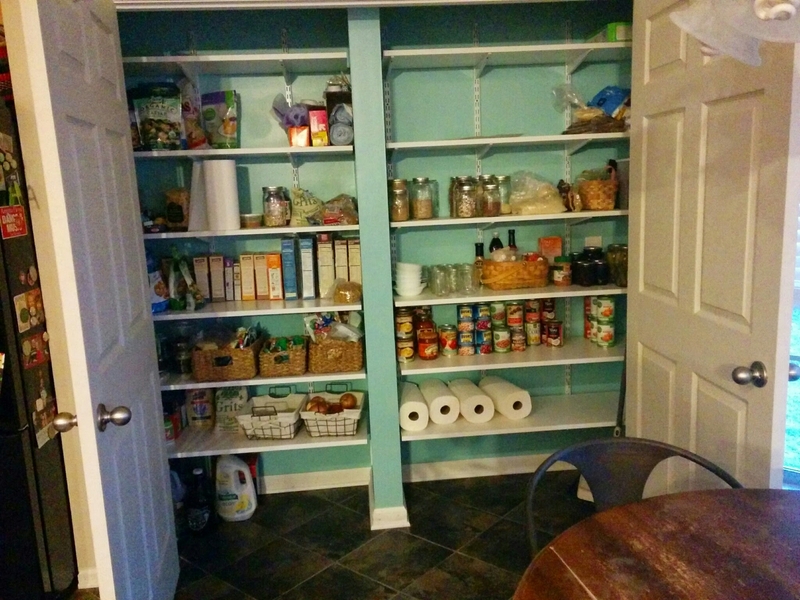 There used to be a useless desk and cabinets tucked over in the corner beside our pantry, and since all we used it for was a dumping ground for papers and craft stuff, we decided to make a bigger pantry of it instead. Now we don’t have to keep our wok in the garage anymore! I forgot to take a “before” picture, but here’s the first stage of renovation. We had the desk and cabinets ripped out and built a wall up around the space. 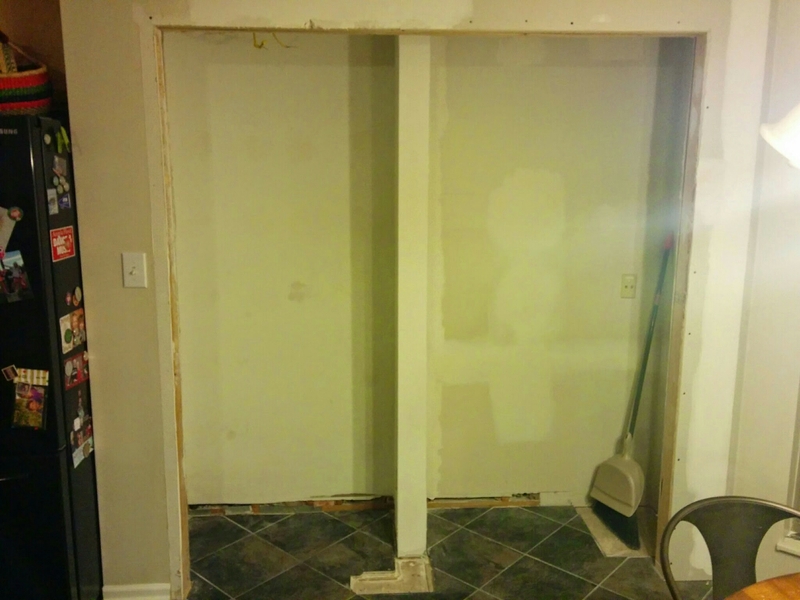 Partway through the demolition, we learned that there’s actually a pipe going through that dividing wall, so we trimmed it back a few inches but left it there. We were worried it would wind up looking dumb, but it actually divides the space nicely and lines up with the edge of one of the doors, so it’s not so bad. We had some lights wired in too and moved a light switch and a couple of outlets around. My wife poured a couple of old buckets of paint together to make a color that matches pretty closely the color of some of the old mason jars that decorate our mantel (we’re southern, not hipsters). Here the shelves are built in and the doors added. The doors were beige for some reason rather than white, so we’ll have to get those painted. You can see here that some of the tile we laid a few years ago had to be ripped up, so replacing that was part of the job too. Luckily, we had some tiles left over from the original job. With doors and shelves hung, I got excited over the weekend and put a couple of things in the pantry even though I knew we couldn’t fully move in yet since there was still tile work to be done and baseboards to reinstall. The doors are a good bit wider than standard doors. 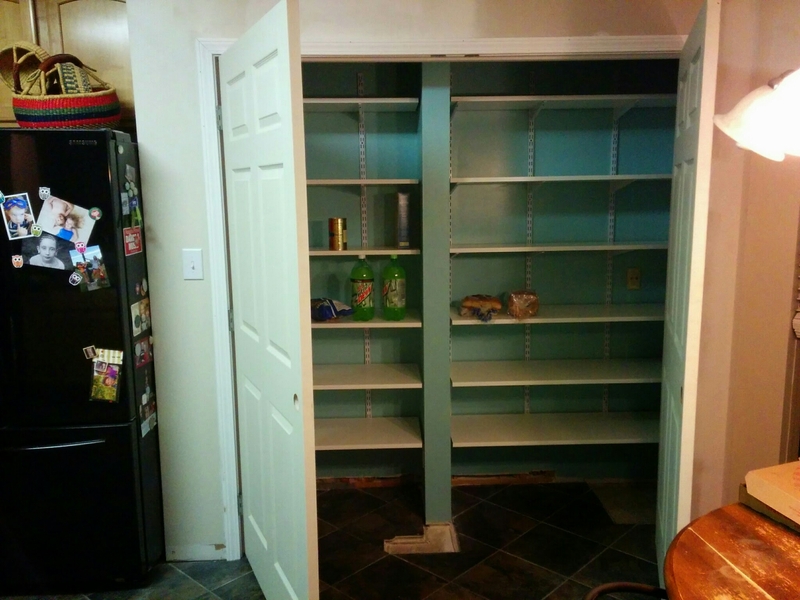 This is a really big pantry, and here’s what it looks like closed, minus door knobs. And finally here it is with knobs, baseboards, repaired tile, and food. We’re really happy with the project. 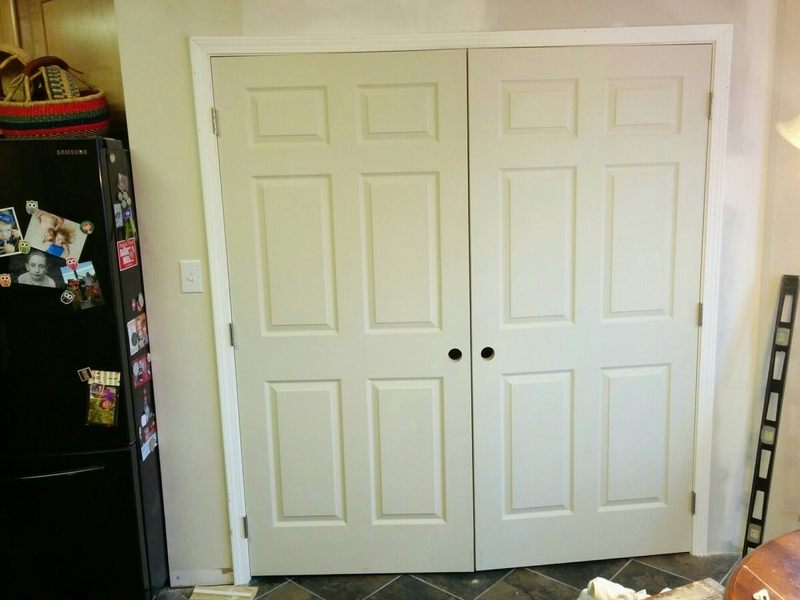 Our carpenter was installing doors on the room I moved my office into and alternating work between the two projects. It took him about 6.5 calendar days to finish up. We still have a little painting to do around both parts of this remodel, but hopefully this wraps up our home fixes for the next couple of years. You may live in a standard subdivision house, but that pantry is larger than all my closets combined. I live in a standard 140 year old house.